It’s nearly the end of the month again, and I’ve not written about Engagement, my May word (see 12 Words). I started, as I always do, with the dictionary definition of Engagement. That didn’t inspire me to any particularly useful insights. Then, I googled it, and most of the hits led me to a 2003 book by Jim Loehr and Tony Schwartz, called The Power of Full Engagement. That was productive but distracting, because it is a very good book (ground-breaking at the time of its release), full of strategies and rituals about how managing energy, rather than time, is the key to full engagement. There are lots of practical and creative ideas about how to manage energy at all levels: physical, mental, emotional, and spiritual. I did a quick read/scan of the book and picked up all kinds of useful strategies for myself and my clients, as I work with them on a foundation of super self-care. But I still didn’t have a sense of what Engagement really means to me. So I did a lot of journaling about it, and I set the intention to live my life engaged. That’s when I bumped into a couple of significant differences in the way that I think about Engagement, and the way Loehr and Schwartz describe it. The central premise of the book is its subtitle: “Managing Energy, Not Time, is the Key to High Performance and Personal Renewal.” I fundamentally agree with this premise, except, for me, it is more about “cultivating” energy (on all levels), not so much about managing it. Another premise of the book is that you either fully engage or strategically disengage. In practicing Engagement, I came to the understanding that, for me, Engagement is a state of being that transcends what is going on with me. So, I am “being engaged” fully with life, whether I am in action or at rest. There is a way to be in “downtime” fully engaged. Engagement is a full “Yes!” to life. It’s easy to say a full “Yes!” to the aspects of life that I love: relationships, nature, my art, learning, my work, and many other aspects of my life. And, that is really useful to realize, because being deliberately intentional about coming to those cherished things fully present and engaged yields even more richness and depth than if I am just going through the motions. There is something about showing up fully engaged that has my intuition and inner connection tuned in, accessible, and flowing. In being fully engaged, I am open, aware, and receptive to the fullness of the experience. I’m available to the gifts and the learning, and the creativity that is inspired from within. But what is Engagement with things that we don’t love so much? I had some health challenges this month, and that turned out to be a blessing. It gave me an opportunity to explore what it is to be fully engaged with that reality and those challenges, vs being detached or just tolerating the conditions, wishing I could get to the other side of them more quickly. I discovered that, for me, Engagement in the stuff I don’t love so much is exactly the same as it is with the stuff that I do love. The first step to being able to be fully engaged is to be present in what is, and I dare say, accepting of what is, rather than fighting it or wishing it were different. When I do the latter, I’m not available to the whole experience. A part of me is walled off when I’m using energy to wish things were different, or fighting reality. It’s a challenge, and a commitment, to learn how to embrace what is, without judgement. Let’s just say it doesn’t yet come naturally to me! But that is what allows me to come to life with awareness, openness, and receptivity, which is essential to Engagement. Then, next, I consciously choose to be all in, fully engaged, with whatever is my life in the moment, and to trust that what is emerging from that is my right path. It’s kind of an “OK, here I am, and I’m going to fully embrace this experience, say ‘Yes!’ to this, and see what is here for me”. When I practiced that, as best I could, with the health challenges, I discovered all kinds of layers to the experience that I might have missed otherwise: the deepened ability to tune into my body and receive its wisdom, the love of people who cared about me, the sensitivity and caring of my health care professionals. If I had been detached rather than engaged in that experience, I might have skated right over the fullness of those dimensions of the experience. I decided that I want to say a whole-hearted “Yes!” to all of my life, like I am a willing and eager dance partner with whatever is showing up for me in my life. This is full Engagement, for me. 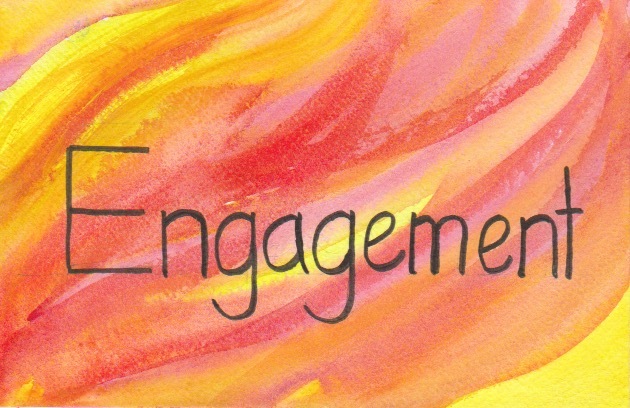 What is Engagement for you? We’re already at the end of April, and I have not posted much about Receptivity. This month has been very interesting, as have the past 3 months, with the 12 Words. 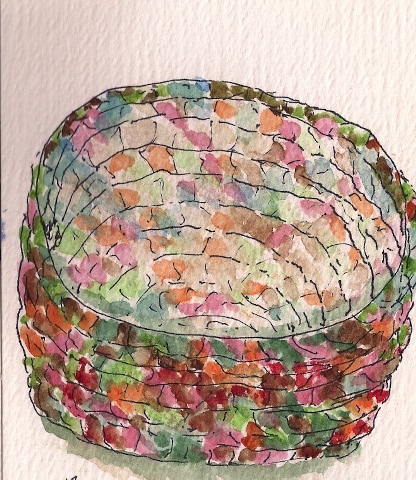 I’ve thought a lot about Receptivity, and journaled a lot about it. I’ve been committed to embodying Receptivity, as much as I can. For me, Receptivity has been the most challenging of the words so far to understand, at a deep level, and to embody. At first I thought that Receptivity is easy, just to receive. What could be easier than receiving? But the more I learned and experienced Receptivity, the more it became clear that it isn’t a passive state. It’s an active practice, and an active presence. It is a constant, conscious shedding, or letting go, of my expectations and assumptions of how things should be, or how they should go. It is continual clearing of my “field”, so that I may be an open, fertile field of openness and awareness. It’s not a destination, but a practice. To really receive the fullness of anything, inner wisdom, someone’s love, an opportunity, a possibility, a surprise, a challenge, we need to be open and aware. And, if we are looking for something in particular, or we are expecting something to come in a particular way, we’re not open. If we are assuming that something in our lives is broken, and needs fixing, all we tend to see is the “broken,” and we miss the inspiration that is flowing through us continuously, moving us towards an even fuller experience of deep well-being, and a knowing of our true nature. Once again, it essentially comes down to living our lives actively present in the moment. As I have said before, for me, that’s a pretty big challenge, but so worth it. What have you learned about Receptivity this month? 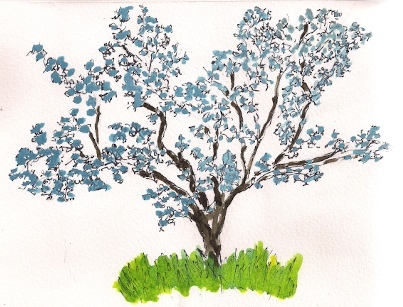 It’s already past mid-month, so it’s time to weigh in on my word for April, Receptivity. It seems like all of my words so far (Curiosity, Vitality, Eagerness, and Receptivity) have led me back to Presence: Being in the Present Moment. So simple, but not always so easy, at least for me. For a long time, I thought of being Receptive as passive, like a field laying fallow, waiting for the farmer to plant something in it. I’m discovering that, for me, Receptivity is a combination of Readiness and Willingness. And, it is far from passive. Readiness seems like a sort of active alertness, a state of being with all of my “receptors” turned on and ready to receive, in fact, expecting to receive. This state of being has a quality of positive expectancy. Willingness is also active. It’s a “Yes!” to life, to what is currently unfolding in my life. It is an active clearing of my inner landscape of what I think things “should” look like in my life, in favor of what really wants to happen in my life from deep within. It’s not a passive waiting; it’s a process of actively offering a clear “landing spot” for creative inspiration from within, and then, when the inspiration “lands,” engaging with it. For many years, I’ve lived my life with a commitment to acting in alignment with my inner guidance and inspiration. This has required Receptivity. I’ve developed practices to help me live that commitment to Receptivity. I can feel in my body when I’m being receptive, and when I’m not. Not Receptive feels like constriction. My body knows, and I know when I tune into my body. For me, moving from constriction to spaciousness is a simple practice of becoming conscious that I am constricted, letting go of how I think things should be, and breathing deeply until I feel spacious inside. Apologies for the late publication of this 12 Words stock-take; I meant for it to publish on March 31. It is an Operator Error: I forgot to push the Publish button! Sometimes life is so gloriously simple. 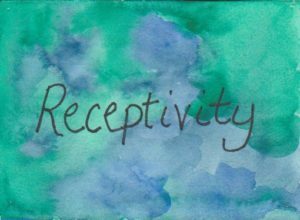 🙂 By now, I’m well into my exploration of Receptivity; I expect to have a blog post about it in a few days. The first three of the 12 Words have taught me so much. 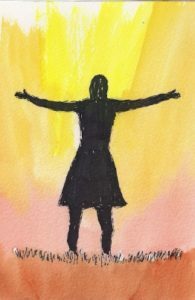 Eagerness (March word) is the quickening – a signal – that points to what’s emerging next through me. It arises spontaneously from within. It needs space to “land”. It’s the breadcrumb trail of my true self. 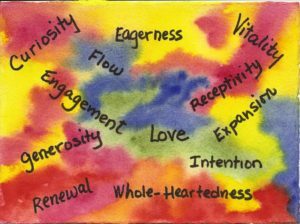 Vitality (February word) is the energy and aliveness that I feel when I am aligned with the creative flow of life unfolding. It is a commitment to presence. It’s a letting go of prior beliefs and assumptions of how things ought to be. It is respect for innate rhythm. Curiosity (January word) is an intention to meet life with an open heart and an enthusiasm to discover. It is a commitment to embrace what is, and be curious about it. It is a “what if” way of being in the world. It is living with a sense of adventure. As for the process of the 12 words, I could never have imagined how this practice of attention would enrich my life, when I began this journey in January. It has grabbed me by the scruff of the neck and taken me on a road of greater awakening to my life. More and more, I am releasing into and trusting the flow of creative spirit unfolding from within, as it takes me in and around and back and forth. It is an unpredictable ride, and it takes me to unexpected places. I think my business is going in this direction, and it is “that”. I assume my health is this, and “that” shows up. And, always, wholeness is calling me to a deeper truth of fundamental well-being that is beyond the apparent circumstances. As a life coach, I have always known that our lives are our greatest creative endeavors, and that it really is all about the journey and not the destination. I am now being challenged to live that knowing even more fully, in a wholly committed way. What the 12 Words have done for me most, so far, I think, is to demand my full presence and attention, right in this red hot moment. It’s a cliche that the present moment is all we’ve got, but it’s more than that. It’s where all the curiosity, vitality, and eagerness of life actually are. I am curious to discover what April’s word, Receptivity, has in store for me. 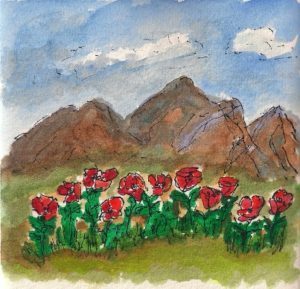 At first glance, Receptivity seems like a soft and passive word to me, but I am sure I will discover that it is much more than that, as I travel further on the path of greater vitality and eagerness in my life. What have Curiosity, Vitality, and Eagerness taught you, so far? This was a message to me about Eagerness, my March Word. Eagerness is a call to pay attention, to open, to receive, and to follow. Eagerness is an energy that arises within me, a signpost or breadcrumb, illuminating the path of my true self. However, Eagerness needs for me to be spacious and receptive in order to show itself to me. If I am too filled, I will miss its energy and its beckoning. For me, attending to Eagerness leads to engagement: it shows me the way to a much fuller engagement with my life. It’s identified by a quickening from within, a very visceral sensation. So I’m practicing emptying, so that the subtle and not so subtle breadcrumbs of Eagerness are apparent to me. I’m emptying my mind as I go through my day. I try to remember to empty my mind each time I walk over a threshold or doorway, during my day. I’m also emptying myself of preconceived notions, beliefs, assumptions, and perceptions, so as to be a receptive field for Eagerness to land. What are the ways that you empty yourself, so that you are a receptive vessel for the call of your true self? Today is the last day of February, and tomorrow, I am on to another of my 12 Words, Eagerness. Vitality, to me, is the flow of creative spirit from within. It is the part of me that is always becoming, ever emerging and seeking expression. It urges me, and when I allow it, it radiates in and through me. Its face and rhythm change. 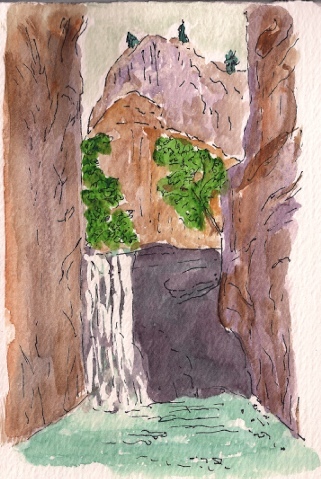 Sometimes it is quieter and meandering, like a waning autumn stream, in the mountains. Sometimes it is a torrent, like a current that is robustly fed by spring rains. My “job” is to join the river and the flow, and for me, this is primarily done by frequent pauses during the day, breathing deeply into the flow of Vitality. When I do that, I feel the rhythm of the flow in my body. I know that on some level, I am this flow. I empty myself to receive the insights and intuitions of the flow, and when it feels the right time, I move as the flow into action. To reach out to someone or something in love and gratitude, in a passing moment. To realize an easier way of moving through something, just as a river finds its way through the boulders. To have that knowing that I am on my right path, and that all is well. To embody a more visionary perspective in the challenges. To act, with a knowing that it is the right thing to do. Vitality asks much of me, as it flows with inspiration and radiating energy. I must choose to join the river. It is a surrender to the flow of the deep wisdom of creative spirit emerging. But I am still, at times, reluctant to give myself fully to it. I must respect the timing of the flow. Sometimes it is moving slower than I think I would like, or faster than I think I can keep up with. Vitality always demands that I be present in the moment. I need to breathe and to sink into presence countless times during a day. I need to be a clear space to receive and sense the flow of Vitality, and to radiate it back to others. Sometimes there are the boulders of my cluttered mind, and I need to open up spaces for the flow to make its way through, in its full flow. Sometimes I need to clear away an ancient beaver’s den of old outdated beliefs and assumptions, so that Vitality can flow clearly and fully. But as much as Vitality demands of me to be committed to allowing its flow, and as much as it needs clear space within me, I’m in. 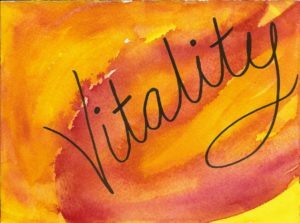 In welcoming Vitality as my constant companion for this month, I have felt the joy of inspiration and the power of radiating energy flowing. I have had moments of knowing that this is how I want to be in my life, living as one with the Emergence of creative spirit from deep within. 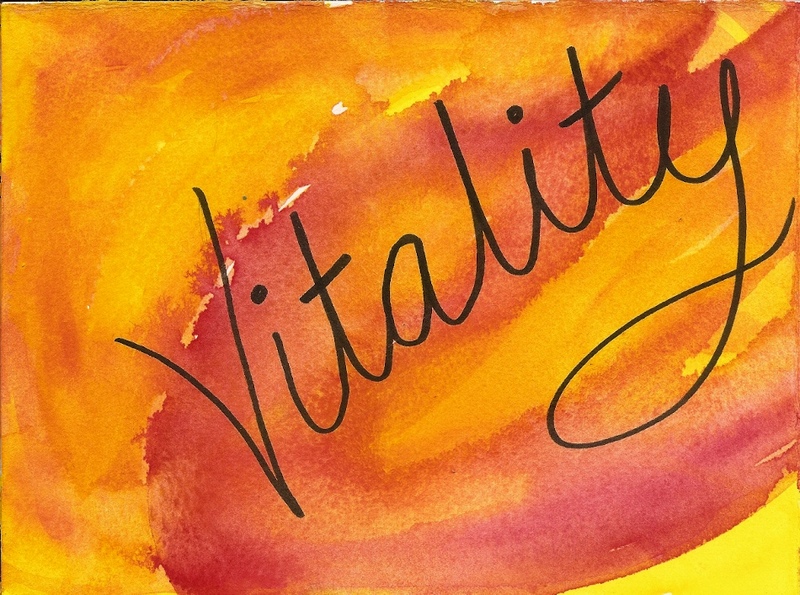 Vitality is a commitment I am willing to make. In my exploration of Vitality, my February word, I am learning that Vitality is living in the flow of our creative spirit within, as it unfolds. I have let this be my life’s practice for years, but I never understood that in this, is my Vitality, until the dots connected for me in my “listening time” this morning, as I continued to contemplate Vitality. “There is a vitality, a Life Force, an energy, a quickening that is translated through you into action. And because there is only one of you, for all time, this expression is unique, and if you block it, it will never exist through any other medium and will be lost. It is not your business to determine how good it is, nor how valuable, nor how it compares with other expressions. It is your business to keep the channel open. You have to keep open and aware directly to the urges that activate you. Graham is specifically referring to the creative artist expression of dance, but I believe – I know – that our lives can be an expression of the creative spirit within us, unfolding and coming to life. And this process certainly isn’t limited to what we may think of as the more traditional forms of art or artistic expression. I have seen this for over 20 years, in my profession as a life coach, when clients release into the knowing – the direction – of just the next step that is arising from within them, and they respect that deep knowing. They know the truth of it; they can feel the “rightness” of it from deep within. Then, by paying attention to that deep inner wisdom, and honoring it, there is a creative unfolding, called their life, that’s very unique and completely authentic to them, that begins to be revealed. What connected for me this morning was that this is Vitality, this “being” the creative unfolding of our life force or life energy, that which arises authentically from deep within us. This is Vitality, this full engagement or fusion with the flow of our own unique creative energy. It is very active and alive. It is empowered. It is real. How do you keep your channel open? How do you live as the fullness of your own Vitality? What brings you alive to the vitality within? Throughout my day, I find myself thinking about my February word, Vitality. I pursue Vitality, and it peeks its head around the corner, teasing me, only to disappear again, like a wisp from an elusive dream. It’s as if I don’t know Vitality yet, but my mind is a portal through which I can pass, to begin to understand Vitality in my heart’s nature. So, Vitality, for me right now, is a concept. It’s a compelling concept. I long to live with a strong sense of animated, radiating, alive energy, and a Yes to life, quite apart from any current physical condition that I may be experiencing in the moment. This idea excites and intrigues me. I want to live eagerly. Vitality seems like a choice, but what are we choosing, and how do we choose? For me, Vitality seems to be an energy that originates from deep within. So, then, it isn’t that I find a Thing that is my “passion,” and then as I do that Thing, and it animates and awakens me, and then I am living and being Vitality. I feel like it is an essence that stands apart from conditions. It’s an enlivening, animating energy that is already there. It’s my birthright, our birthright. The questions for me now are: how do I invite this animating energy to be fully present, in and through me? How do I awaken fully to it, deep in my heart? How do I allow it to awaken me? Yesterday, I wrote about what curiosity, my January Word of the Month, has taught me. I am a month into my 2018 12 Words adventure of holding a word a month in my awareness, exploring what it means to me, embodying it in the way that I live, and learning what it has to teach me. What has it meant so far, to live with a word for the month? 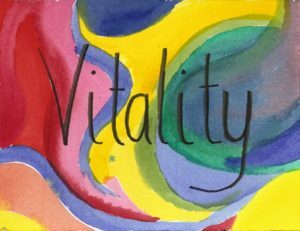 I have loved living with a word for a month, and I’m already looking forward to my adventure with embodying Vitality, in February. For me, it was like having an amiable companion in my walk through life. When I was feeling good, curiosity felt like a playmate, showing me things that I would have otherwise missed. I saw things as if for the first time. I discovered many surprises. What if I’m not seeing the whole picture? What if something else is also possible? What if I look at this another way? What might also be true? When I remembered my commitment to curiosity, these questions emerged quite naturally and spontaneously, as if to ask them was to show respect to curiosity. When I forgot about my word, I felt like I missed some of the richness and depth of my world. I love having a word to companion me, and to inform me in my journey. I’m very much looking forward to what I discover with vitality as my new companion, in February.